02/03/2008--With the failure of the meeting of heads of state of Bolivia, Argentina and Brazil over Bolivian gas sales to its neighbours, Cristina Kirchner asked for the concretization of Venezuela's entry into Mercosur. Her demand showed how hard it is to negotiate with President Lula of Brazil, who has signed a strategic deal with George W. Bush to produce biofuels. Put another way, Kirchner proposed that the Brasilia-Washington axis be counter-balanced by a Buenos Aires-La Paz-Caracas alliance so as to be able to negotiate with Brasilia under different conditions. Unhappily, Cristina's words are just not enough. Her husband extended for 30 years the contracts by which Carlos Menem gifted to foreign capital Argentina's most important reserves of gas and oil. The state energy company ENARSA has not restrained the arrogance of Repsol (now with major US shareholders) or of Petrobras, Brazil's State oil company. On two occasions Kirchner told Evo Morales that if foreign companies were unwilling to invest in Bolivia, Evo had only to pick up the phone to get US$1.5 billion from Argentina. What became of that promise? In Bolivia itself, the re-launched state hydrocarbons company YFPB is an empty shell. Before it can even walk it has been decapitalized by a benefit payable to students which has to be paid with income from the hydrocarbons nationalization, which has to be paid by the impoverished State entity since that income does not figure in the contracts with foreign oil companies. YPFB has just handed over to Petrobras gas fields in the areas traditionally under its control. Instead of the energy agreement with Venezuela of January 2005 being implemented, YPFB asked PDVSA for 53 service stations. They were not installed either. Relations with Iran have a high political cost for Bolivia that could be justified with gas and oil agreements. Instead, Teheran will install a television channel. Evo's criticisms of the United States have been persistent. However, rather than fulfill the Nationalization Decree which provides for YPFB to take a majority shareholding in Transredes - the Shell-Enron subsidiary operating Bolivia's gas pipelines - that consortium's own presence in the country gets bigger every day. For his part, Hugo Chavez is embattled with the Exxon-Mobil giant and Lula has frozen the Southern Gas Pipeline project in which Bolivia could have participated so long as 50% of its gas production was processed in Bolivia. Petrobras will invest in Bolivia so long as it can veto any domestic processing of Bolivia's gas. The New World Order posits the disappearance of weak national states. That real world fact was not taken into account when indigenous rights were prioritized in a way that has ended up strengthening the separatist groups of Santa Cruz. 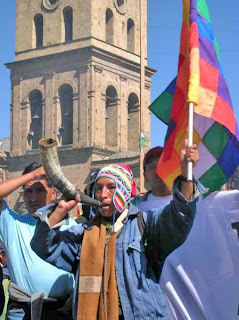 Another thing not given its due measure has been the damage caused to national sovereignty by the presence of Non-Governmental Organizations which have funded both indigenous movements and Evo Morales' political party, MAS. Now, Evo censures USAID for its interference in the country. Is it because he is unaware of the presence of the Soros Foundation and NGOs like CIPCA (run by Xavier Albó), CEJIS (which according to Leonardo Tamburini gets funding from the US, Britain and Germany), OXFAM (funded by BP, and the Rockefeller and Ford foundations), Tierra (of Miguel Urioste) as well as Qhana, Aclo, Cepad, Cedoin, IPTK and others that get funding from the US, the United Kingdom, Spain, Switzerland, Sweden, Denmark, Holland, Canada and the Vatican? Unless Cristina and Evo resolve their domestic contradictions the mutually protective Bolivia-Argentina-Venezuela axis will continue to be a chimera.